I am wearing my International Executive Music Hacker hat today. I’m writing this blog post at 5AM somewhere over the Atlantic Ocean, on my way to the Barcelona Music Hack Day, where I’ll be representing both The Echo Nest and Spotify. I’m pretty excited about the hack event – first, because it’s in freaking Barcelona, and second, because I get to talk about what’s been going on with the Spotify and Echo Nest APIs. It has been just about 100 days since The Echo Nest and Spotify have joined forces. In that time we’ve been working hard to build the best music platform for listeners and for developers. This week we are releasing some of the very first fruits of our labors. First up, we are releasing a new Spotify Web API. This is a complete revamp of the Spotify Metadata API (the old version has now been deprecated). The Spotify Web API gives you access to all sorts of information about the Spotify catalog including details about artists, albums and tracks. Want to know the top tracks for an artist? There’s an API for that. Looking for high quality album art, artist images and 30 second audio previews? There are APIs for that too. Best of all, the new API includes perhaps the most requested Spotify API feature of all time With the Spotify Web API you can now create and modify playlists on behalf of authenticated users. 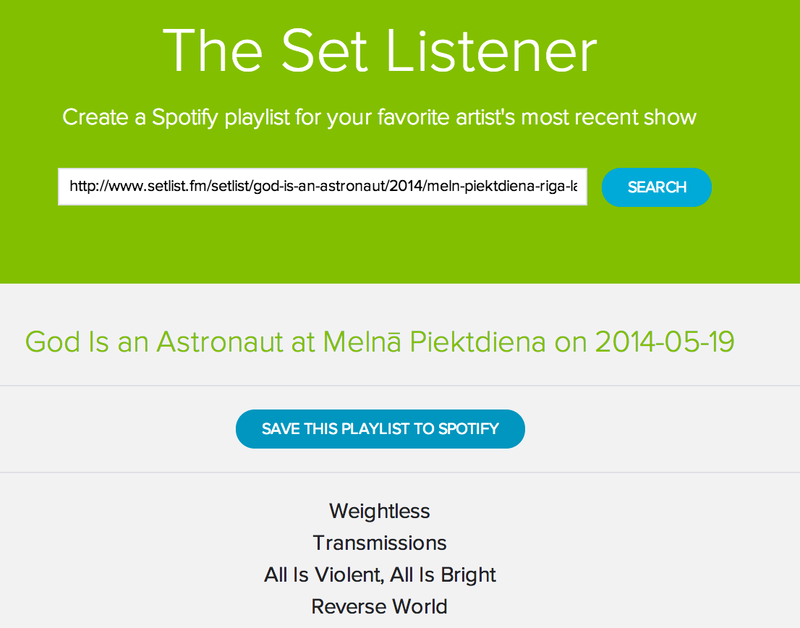 Yes – you can now create a Spotify web app that creates playlists. (I personally requested this feature way back in 2008, here’s my begging plea for the feature in 2009). I’ve been using the beta version of this new API for a couple months now and I must say I am quite impressed. The API is fast, super easy to use, and provides all sorts of great data for building apps. In the past weeks I’ve had fun converting a number of my favorite apps to use the Spotify API. First there’s the Road Trip Mix Tape that lets you create a Spotify playlist of music by artists that are from the very towns you are driving through. Then there’s Music Popcorn, a visual interface for exploring genres. For the less visual, there’s the Genre Browser that gives you lots of details about the different music genres including playlists that help give you a gentle introduction to any of the thousands of Echo Nest genres. Next there’s Boil the Frog, an app that creates seamless playlists between any two artists. Finally there’s the 3D Music Maze, an app that lets you explore for music by wandering through a 3 dimensional music world. Next up, a freshly minted Echo Nest + Spotify Sandbox — a new Spotify ID space. These apps are possible because of the second thing we are releasing this week – a spiffy, shiny new Spotify Rosetta Stone catalog that ensures that the Echo Nest API has the freshest, and most up-to-date view of the Spotify universe of music. For those who might be new to The Echo Nest, Project Rosetta Stone is something we’ve been working on here at the Nest for many years. The goal of Project Rosetta Stone is to solve one of the most common problems that nearly every music app developer faces. The problem is that every music service has its own set of IDs – a music subscription service like Spotify has its own artist, album and track IDs. 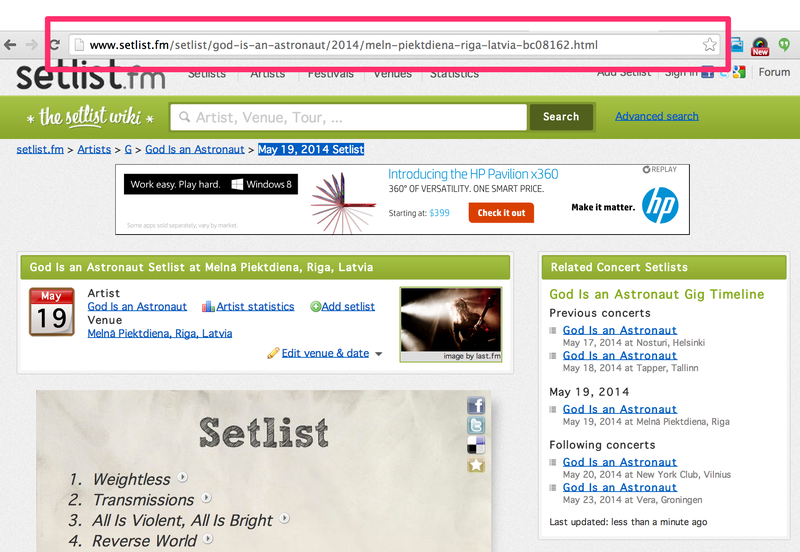 A lyric service has its own (and very different) IDs for those same artists, albums and tracks and a concert ticketing API has yet a third set of IDs. This is quite problematic for app developers that want to build an app that combines information from multiple services. Without a common ID system, the app developer has to resort to metadata searching and matching – which is slow and quite error prone – this results in a poor app. Project Rosetta Stone solves this problem by providing ID mappings between as many music services as we can. With this mapping you can easily translate IDs from one ID space to another. With Rosetta Stone, if you have the Spotify track ID you can get Lyricfind and/or Musixmatch IDs making it easy to use those respective APIs to retrieve lyrics for that song. You can easily map the Spotify artist ID to a Songkick or Eventful ID to get ticket and touring information from those APIs. And of course you can use the Spotify track ID to get detailed Echo Nest information about the song such as its tempo, energy, danceability, along with detailed Echo Nest artist data such as latest artist news, blog posts and similar artists. We have had Spotify IDs in Rosetta Stone for many years, but this particular mapping has in the past been problematic for us. Spotify has a huge catalog and keeping the mapping fresh and up to date between Spotify and The Echo Nest has always been a big challenge. There’s a huge back catalog with millions of tracks to deal with plus thousands of new tracks are being added every week. The result was that there was always a bit of a lag between when updates to the Spotify catalog were reflected in the Rosetta Stone mapping. This meant that if you built a Rosetta Stone-based app you could find that The Echo Nest wouldn’t always know about a Spotify track, especially if a track was very new. The result would be a less-than-perfect app. This week we are releasing a new Spotify ID space. Our engineers have been working hard over the last 100 days to set up all sorts of infrastructure and plumbing to ensure that we have the most up-to-date view of the Spotify catalog. No more lag between when a new track appears in Spotify and when you can get Echo Nest data. Plus, all of our APIs that take IDs as inputs will now also take Spotify IDs as input as well. If you have a Spotify artist ID you can use it with any Echo Nest artist API method. Likewise, if you have a Spotify track ID you can use it with any Echo Nest song or track API method that takes a track ID as input. This makes it **really** easy for developers to use The Echo Nest and Spotify Apps together. For example, here’s an API call that returns detailed audio properties for a Spotify track given its ID. So yes, I’m pretty jazzed about this trip to Barcelona. I get to create a music hack, I get to spend a few days with some of the best music hackers in the world (The Barcelona Music Hack Day, as part of the Sonar Festival tends to attract the top music hackers). I get to spend a few days on the Mediterranean in one of the most beautiful cities in the world. Best of all, I get to talk about the new Spotify and Echo Nest developer platform and help music hackers build cool stuff on top of the newly combined platform. Keep an eye on this space for I’ll be updating it as we continue to integrate our developer APIs. There’s lots more coming, so stay tuned! You are currently browsing the archives for the The Echo Nest category.